After an intense 67 hour train ride we finally arrived in Moscow. I didn’t know much about Moscow, I’d heard of the Kremlin, Lenin and the Red Square (the last of which I’d heard of a couples week prior to arrival). 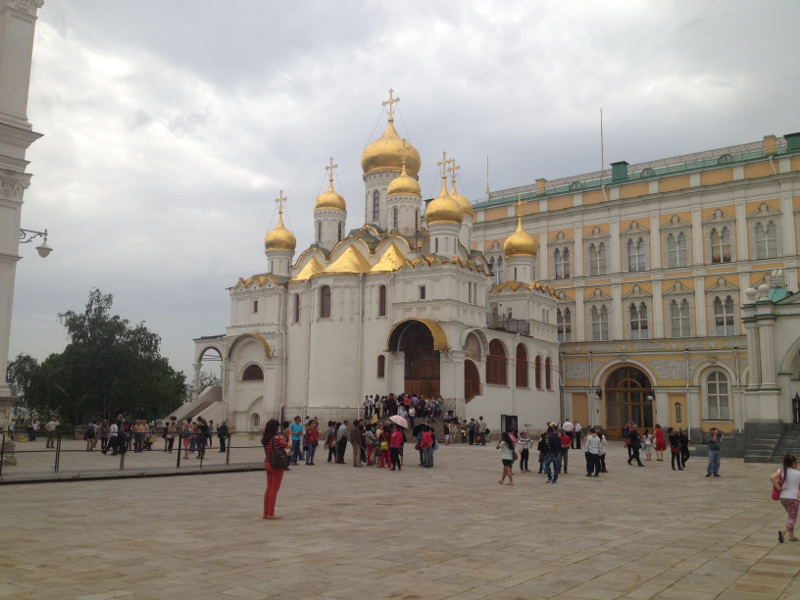 The plan was to spend four days or so visiting the attractions in Moscow. Oh, and many of the Russians we met on the Trans-Siberian train said “Moscow is not really part of Russia, it’s a different city.” Pretty much how many countries look upon their largest city but they were adamant we wouldn’t like the city. 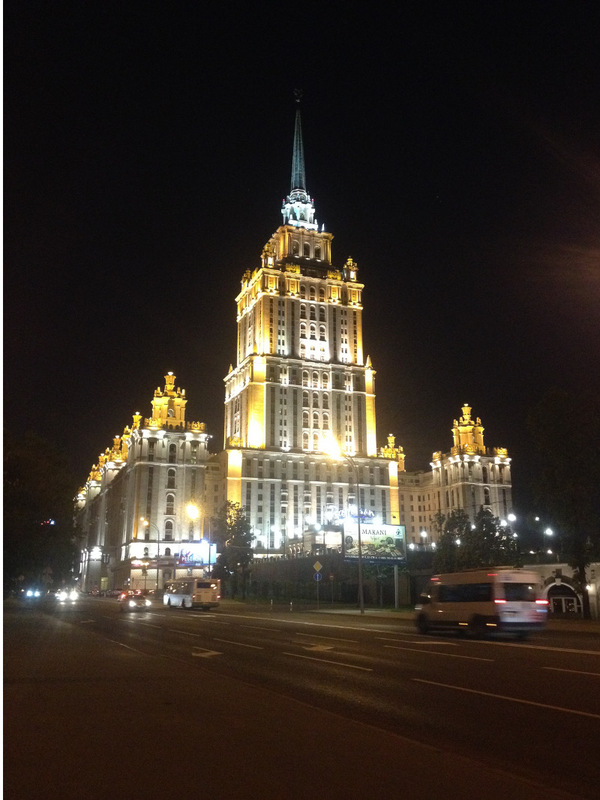 After four days in Moscow I was very impressed by Moscow. There are several things to do in Moscow you shouldn’t miss, a couple of things you should look out for, others only if you’re staying in the region for a while and a couple that are worth skipping out on. The Red Square is something you have heard bits and pieces about. It’s the most obvious spot to start the tourism explorations for a full day, so that’s exactly what we did. When you arrive, you sort of just end up in the square. I was really hoping the whole square would be red, it wasn’t to be but your definitely know when you’re in the Red Square. There isn’t a whole lot to do there other than get various snaps of the bits and pieces on the edges. Let’s Go See Dead Lenin? There are Lenin (former Russian politician – read his Wiki if you want to known more) statues all over Russia and Eatern Europe. But nothing is more bizarre than seeing an actual preserved body, Lenin’s body. Regardless you ought to go. It’s a free attraction in the Red Square and as long as you go early in the morning you can have it accomplished within minutes. Simply find the line in the Square…you’ll see the area where the body is soon enough, wait your turn, step down into the display cabinet area, walk past the body and feel hurried as you head back up to ground level again. 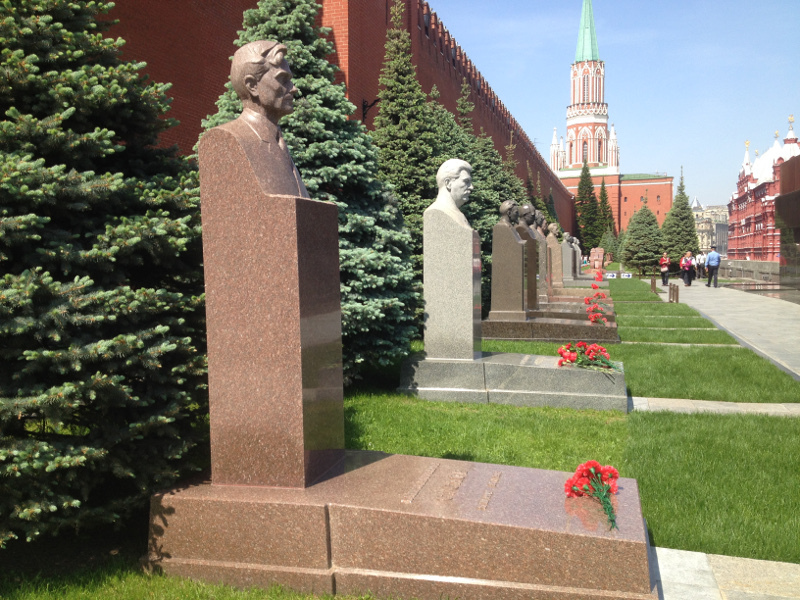 It’s a pretty whack experience to see Lenin’s body. I can definitely still picture it in my head, so plasticy! You may be allowed to take photos, but it just seems like a whacky experience and taking photos of dead bodies is awkward. Check out Google image results of Lenin’s body here if you really want! Next up, time to checkout the Kremlin. One side of the Krelim’s walls border the Red Square and for 500 rubles you can go into the grounds. We didn’t go until a bit later, but to be honest it was a bit of a let down. There are some interesting pieces but I just didn’t come out going WOW that was so interesting at any point in time. Watching the change of guard next to the Tomb of Unknown Soldier was more interesting than anything inside. Maybe because we had been to the Armoury beforehand. 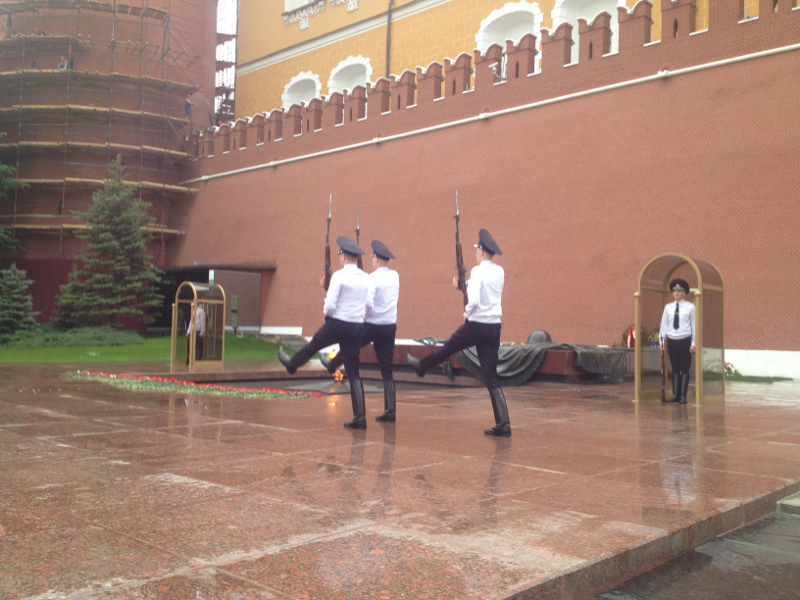 When we purchased our ticket we thought for 800 ruble we were getting a ticket for both the Kremlin and the Armoury. That is not the case, just be aware of this when you visit. Sometimes the ticket queues are hectic and lining up twice is overrated. Definitely go to the Armoury. It is epic! You get given an audio set with headphones and then you start your self guided tour. There are all sorts of bits and pieces to look at, including you guessed it – armour! There was lots of memorabilia throughout Russian history but most of all I liked the eggs. They aren’t just any kind of eggs, but jeweled eggs which were first made in 1885. They were traditionally given as gifts from royal members to their wives or family to mark special occassions. They aren’t all looking the same that’s for sure, some have designs created outside them…others open up and have mini replicas such as trains and ships within them. They were so fun and it would be an awesome gift I’d be chuffed to receive when it’s personalised. They were so cool, that the Faberge Museum was definitely on the bucket list when we visited St. Petersburg. If you have just one day in Moscow, this will likely keep you busy for the whole day. But you will most likely be in the city for at least a few days so it’s time to continue on. What was quite pretty too look at on the outside is St. Basil’s Cathedral, I wasn’t feeling inspired to go inside but the others I was with said it was awesome and being ranked #2 of 2000+ things to do in Moscow on TripAdvisor means I probably should have searched harder for the inspiration. Picture above is the closest I could find on the Google machine. I’m the opposite of a fashion guru but there are certain styles I still like. In Moscow there was this ‘fashion (probably the wrong word) where ladies would wear a yellow dress and yellow shoes. I’d never seen anything like it but it was something that definitely caught my eye. I saw maybe 8 or so girls wearing this costume and could spot them hundreds of metres away. Never got creepy enough to take a photo unfortunately. it was bizarre as I never saw these curious yellow costime wearers in St. Petersburg or anywhere else in Eastern Europe. Living in a big city, the metro probably means you are off to work giving you negative images in your mind. Moscow is different and the Metro is actually one of the must see attractions in Moscow. She’s a big city so unless you stay right by the Kremlin you’ll want to check out a few of the fanciest metro stations. The Metro is real cheap and efficient so it won’t take you to long. There’s plenty of resources listing the best stations, this one should do the trick. 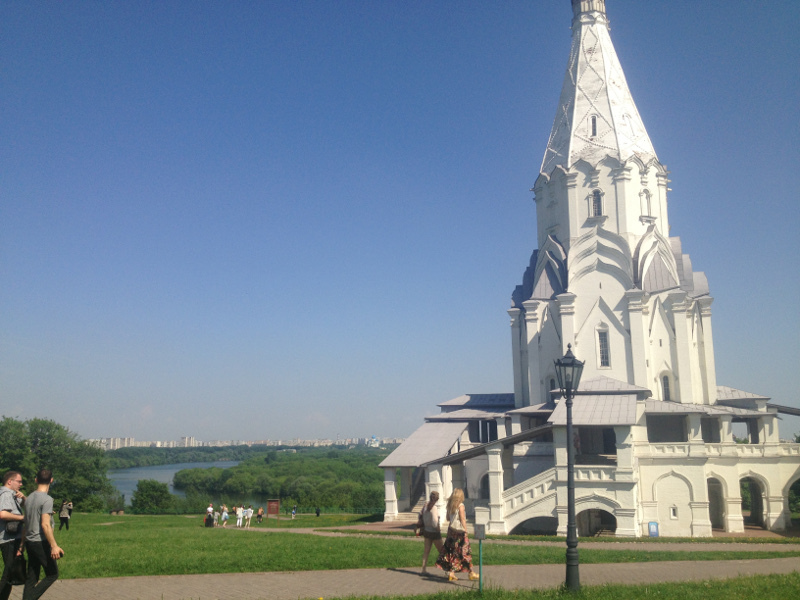 I enjoy visiting parks in big cities, and having investigated teh UNESCO World Heritage Sites in Moscow I decided to head out to the Church of the Ascension. It was definitely worth the mission (still reachable by metro). The park was huge and while the Church is the centre piece most people have more fun exploring the various nooks and crannies of the park. There was locals out getting their tan on next to the river and the people watching was fun having found a stretch of outdoor bars. Highly worth the visit if you need a break from people, concrete and are in Moscow for at least three days. Well, don’t be dorky but this is the place a lot of people seem to relax a bit more. You can chill out, investiage some art sales, walk along the river, play some sports, go for a run, all sorts. 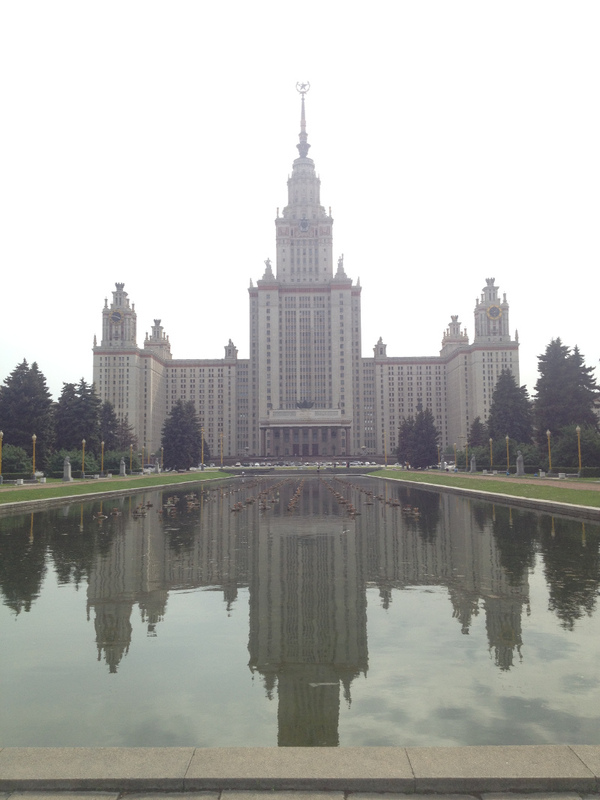 The Moscow State University building is one of the sevens sister buildings in Moscow. And is one of the highest points in Moscow, though the view isn’t spectacular. If you want to go for a large walk. Catch the metro to the University and follow the river back to Gorky Park (it takes a couple hours). The building is pretty cool and they are fun to keep an eye out for. The Hilton Hotel for sunset is pretty spectacular. We were staying close by to Arbat Street. It’s the walking street in the city where lots of creatives are out and about and it’s lined with restaurants. We went for dinner here and then spent a good amount of time walking up the street where there is no shortage of things to catch your attention. Sports Bars. What Are They? One of the State of Origin matches was being played while we were in Moscow, and I figured it wouldn’t be hard to find a sports bar in Moscow playing the game. It was an early afternoon match for our time zone and Moscow has plenty of sports in its culture. Yet, I went to 6 bars who all advertised themselves as sports bars but they either had one small TV or none at all. Not sure what the reasoning is, but if you plan to watch sport on TV while you visit, plan in advance! While in Moscow, I was trying to learn a bit about the history of the region (don’t think I’ll be a hero in your pub quiz team, the info didn’t stay in the brain for long). Pushkin is a well known Russian poet so trying to be all cultural and stuff decided to head to the Pushkin Cafe. Unless you want to go for high tea where you pay through the roof, don’t bother. I walked in, didn’t feel welcome, sat down, got awkward and left. Not quite the cultural thing I was looking for. Was simply an upmarket cafe utilising the Pushkin name to charge through the roof for what is probably stock standard food. We visited this park one morning and it was bizarre. It was like an abandoned amusement park. 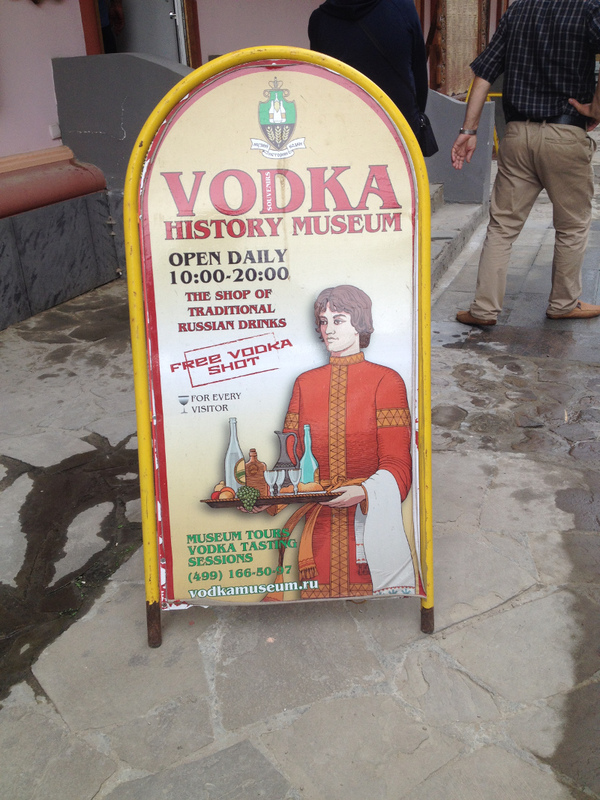 Apparently it was closed but there was a few things open still, inluding the Vodka Museum. Still definitely not worth the visit. After our intense train ride we were told to get on the subway by one of our new fellow Russian friends (massive language barrier) and get off at a stop in the heart of town. As we walked out the the subway world my first sight was of the massive intersection and the greyness of the buildings. We had no idea where we would be staying so we decided to go straight to the travellers trustiest WiFi resource, Macca’s! We ended up meeting an ex-pat American who had relocated his family to Moscow so he can teach English, the loved the lifestyle. He introduced himself having heard us bantering in English, something that’s not very common he said. After a few recommendations from him we decided to head to Bear hostel. We struggled to find the hostel having found the building it was supposedly in. Unlike the western world, branding is very minimal and throughout Russia and eastern Europe. Finding hostels wasn’t ever easy. Once we arrived, all was well. It wasn’t the most social of places but adequate for our needs and is a good balance between price and location for the backpackers on a budget. After enjoying Moscow, hopes were high for St. Petersburg. Yet, I just didn’t really enjoy it. I think it was simply because there’s so many people in the city which made it impossible to walk in a straight line down the pavement. It’s wasn’t that bad I guess. FABERGE MUSEUM! Moscow simply was my preferred city of the two. Is It Safe To Visit Russia? With all of the ISIS related drama going on, Russia has been in the headlines for various aspects of the role they are playing in the ordeal (I’m no expert on the place). Unlike other countries however, there isn’t much in the way of terrorism happening in Moscow, or the rest of Russia. I’m not sure why but it is what it is and no one seems to be saying ‘don’t visit Russia’. The way I see it? The world is a massive place. Moscow’s population is over 10,000,000. It would be a rather unfortunate sequence of events to take place for you to end up in the wrong place at the wrong time. I had a bunch of calculations written out but deleted them, fail. I really hope terrorism stops completely but that’s wishful thinking right now. So is travelling to Moscow safe? YES! 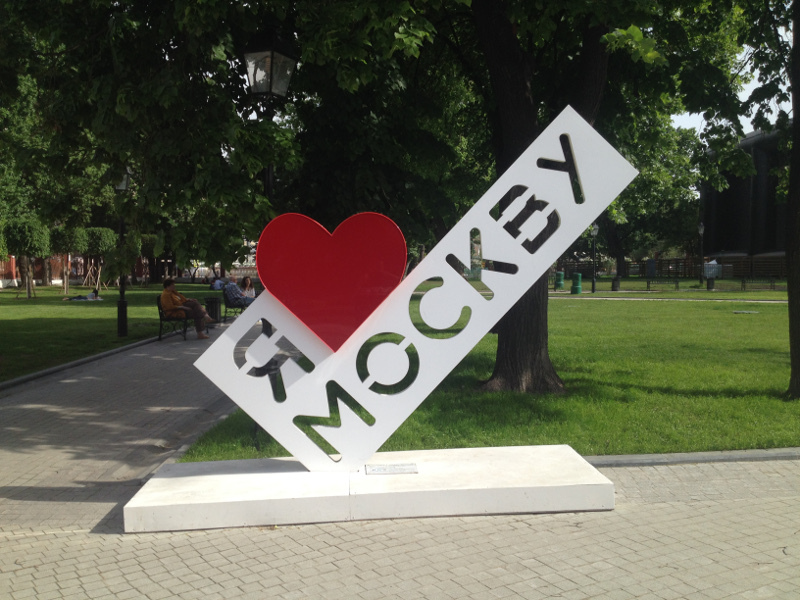 There are so many Attractions in Moscow, you’ll find something you love. If you have been, let me know what your highlights were.